Sanu Maliyil, Thomas Davis and Jeff Evans of CDS ready for the Forbes Currajong Charity Golf Day. THE inaugural Forbes Currajong Disability Services Charity Golf Day was held last weekend on Sunday November 4 at Forbes Golf Club. 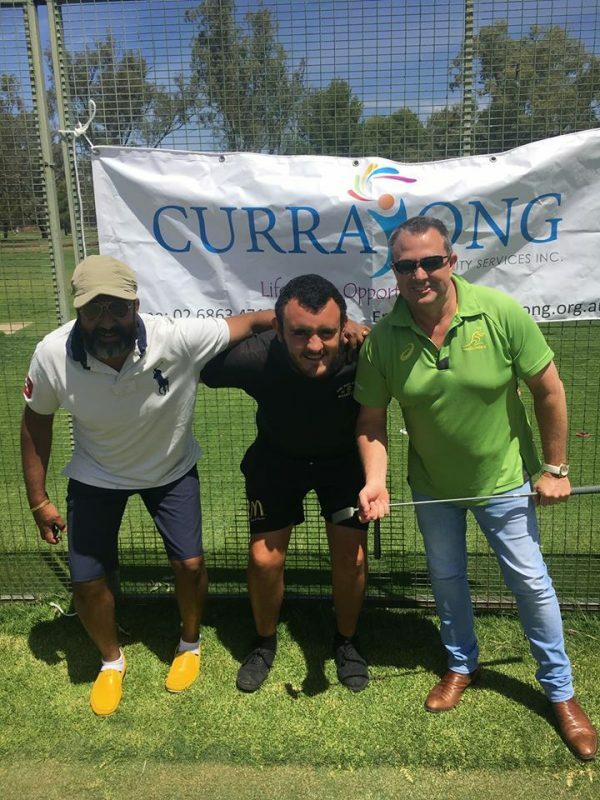 The event, which was a fundraiser for Currajong Disability Services, was a three-person Ambrose team competition and attracted entries from Parkes, Forbes and Condobolin. In total there were 66 players. “We have absolutely floored with the interest and turn out for the event,” said Currajong Disability Services Communications and Marketing Manager, Dane Millerd. “We held a BBQ, lucky door raffles and trivia on the day as well. “There was also a silent auction for some blue chip items,” said Millerd. In total there were 21 sponsors and 13 major prize events with final fundraising numbers still being counted. “I’d like to take this opportunity to thank our supporters Wan Wah Chinese Restaurant, Forbes Services Club, Subway Forbes, Local Legends Entertainment, Westpac Forbes, Forbes Golf Club, Bunnings, Target Parkes, Gotta Love It, Spotlight Forbes, InkheArt, Roylances, Dolly Allan, Post Office Hotel, Taronga Western Plains Zoo, Power Tools Plus, Forbes Pre-School, Parkes Caravans, Blue Sky and of course Bernardi’s for the food and Forbes Shire Council who kindly came on-board to run the BBQ and promote the event. “We couldn’t have a day like this without them!” said Millerd.